As an educator it has been my goal to captivate my students and engage them in their work However, engagement is not easy to come by when many students are uninterested in the subject matter that I am trying to teach. When I first began teaching I recognized a major issue for my students (and for me! ): they didn’t like math. Could I blame them? When I was a student, my attitude toward math was no different. It was the subject I liked least because it was repetitive and we were expected to learn by rote. I found math irrelevant and unimportant. This experience is what motivated me as an educator. I asked myself how I was going to engage and challenge my students critically about math when I hadn’t much liked it myself. I had to consider twenty-first-century learners and their demands for engagement. I knew that giving my students ownership and making math relevant were my best options. 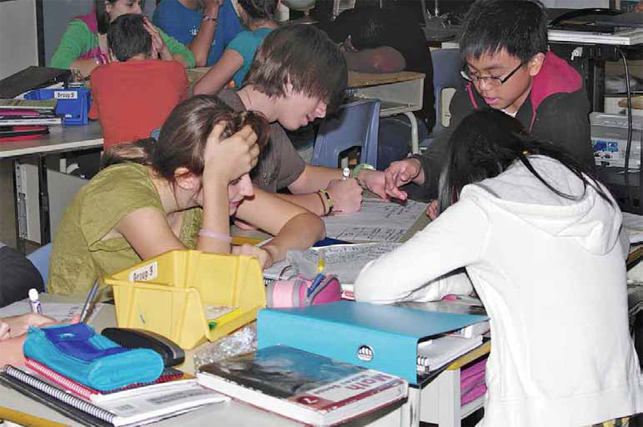 The Three-Part Lesson in Mathematics: Co-planning, Co-teaching and Supporting Student Learning (http://resources.curriculum.org/secretariat/coplanning/) is a wonderful instructional tool provided by the ministry of education. This resource gave me an opportunity to reformat how I taught math. It allowed my students to take ownership of their learning and allowed me to have a classroom full of critical thinkers and problem solvers who were interested in math. The essence of the three-part lesson is to give students open-ended problems with multiple entry points. Students work with partners at their level to problem-solve and develop a result. They are encouraged to justify their thinking by any means necessary and use the methods that best suit their needs. My role as the teacher is to facilitate and guide their thinking without pushing them toward one commonly practised method. After students have had the opportunity to work through the problem, we discuss as a class the different methods they used, what worked and what didn’t. This is a fantastic way to get the dialogue going in a mathematics classroom! I encourage my students to justify their thinking. The discussion also provides them with the chance to ask questions, and develop an understanding of concepts that they didn’t quite get. Students who have developed an interesting way of solving the problem take a lot of pride in their work and are willing to act as peer teachers for the rest of the class. The students who have difficulty coming to an end result are now learning as a result of the interaction with their learning partners and from the class discussion. Students are not worried about taking a risk or getting a “wrong” answer because they know that they will be able to gain an understanding of the concept during the discussion portion of the lesson. One activity my students did was finding persuasive bias in a variety of magazines, ranging from Nintendo Power to National Geographic . I asked my grade 7 and 8 students to compare the number of ads and the number of articles in the publication and to represent their collected data in an interesting way. I also asked them to make a generalization or conclusion about their data. During our discussion, students presented a variety of different graphs from pie charts to bar graphs, whichever method worked best for them. Some also made generalizations about what their data meant. One conclusion they reached was that Nintendo Power was a biased publication because even its articles advertised Nintendo products. The discussion showed many students new data management procedures. This problem allowed us to talk about different kinds of discrete data graphs, the difference between discrete and continuous data, how to use data collection to identify bias, and how to use data collection to persuade an audience. These tasks also highlighted how mathematics connects to textual and media literacy. Using the three-part lesson allows me to address the various learning styles, needs, exceptionalities, and multiple intelligences of my students. Because the problems are open-ended, the tasks and lessons are automatically differentiated for any learner, giving students working at different levels an opportunity to be successful and to bring their own background knowledge into the solution. Eliminating the stress of following a specific formula or method takes the limits off of what they are capable of doing. Being allowed to approach math in a way that is relevant and meaningful creates a risk-free environment that allows mathematics discussions to become richer and deeper. My students have formed a community of thinkers where everyone’s opinion, strategy, and solution is valued. Even solutions that don’t quite work are valued, because every thought contributes to the collective understanding of the concept under investigation. My students’ attitudes toward math have completely changed as a result of this three-part structure. When I allow my students to work through and investigate what I am trying to teach them, they feel as though they are an essential part of the learning process. Students who have previously shown frustration and difficulty with math are now enjoying it and becoming engaged in what they are learning. he solved the area (a concept previously taught) and layered the area repeatedly to represent the height of the prism. The rest of the class was fascinated by his thinking and he took great pride in being able to “teach” his peers. My math program has also had a great impact on those who prefer to think creatively, and on higher-level students. When not limited to the confines of “one right answer,” those who are already at a higher level are encouraged to go beyond what is expected. They are able to extend their understanding of math concepts to other areas of the curriculum, such as using data management as a persuasive strategy. This method has particularly benefited those who prefer creative learning as opposed to learning concrete concepts. When math was made relevant and was connected in a cross-curricular way, these creative thinkers developed a greater understanding of why math is important. When it comes to engaging students in math, the limitations do not lie with the subject matter, but rather with the way it is taught. By moving away from regimented and traditional approaches, teachers can engage students and make math purposeful for them. Math can be exciting! And I’ve learned that if I am excited and passionate about what I’m teaching, my students will be as well. Two years ago Lisa Galvan and colleague Kevin Alles, members of the Greater Essex County Teacher Local, created a visual arts resource for Intermediate teachers in their board. This was made possible through a grant from the Teacher Learning and Leadership Program (TLLP).